Programs are tailored to the Modernising Scientific Careers agenda to educate the future professional clinical workforce in Clinical Physiology. Degrees incorporate work training placements within professional healthcare clinics specialising in human pathophysiology for Cardiovascular, Respiratory and Sleep Physiology which are conducted over an extended curriculum. Placements for Years 1 and 2 commence at the end of May for 10 and 15 weeks respectively. Third year projects conducted within the NHS setting commence in January for 25 weeks. Work placements are an integral part of the course and achievement of competencies are compulsory for progression to the next year. Acceptance onto the course are subject to both occupational health checks and criminal records bureau screening (which is in line with NHS policy for access to confidential patient records/samples). 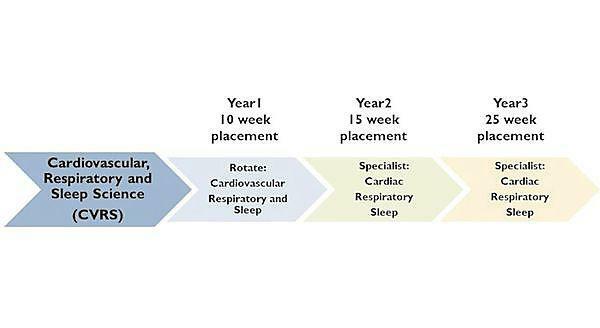 Placements for the physiology pathway include rotations between disciplines in the first year and then specialism training in years 2 and 3.